Love bugs? Then participate in the Pollinator BioBlitz, October 5 – 21. [We have] two goals in mind: to increase awareness about pollinators, and about the habitat that they require. Johnnie Smith is with Texas Parks and Wildlife. Pollinators include bees, butterflies, beetles, moths and other critters that move pollen while foraging. If you participate in the pollinator bio-blitz, you’re going to have an opportunity to observe pollinators at a site that you visit, like your local zoo or aquarium or nature center. And observe the pollinators that are there. Grab a picture of the pollinators you find, and you can post them onto Instagram. We’re asking all of the participants to use the hashtag #TXpollinators. Post findings, on iNaturalist.org. 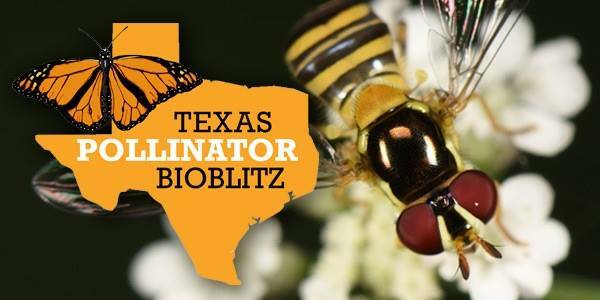 Texas Parks and Wildlife’s website, has pages dedicated to the Pollinator Bioblitz. Where people can learn what pollinators might be in their area. Links to what might be blooming in your area right now—that’s hosted out of the Wildflower center—and then also, to be aware of habitat you have that supports pollinators. And if you don’t have habitat in or near your home, school library… We’re encouraging people to try and get organized in planting pollinator habitat. The Pollinator BioBlitz is October 5 through 21. You are currently browsing the archives for the #TXpollinators category.